Developed for metric cruiser bikes of all sizes in a classic tread design. First time I purchased tires from Rocky Mountain. The tire pricing and free delivery were awesome (saved between 30-40%). I ordered them on Friday afternoon and they were on my porch in less than 24 hours. Definitely will be using Rocky Mountains n again. This tire is awesome and holding up well. I would recommend this tire to more and buy the same one again. Have 13000 on front tire. Changed rear at 11500. Front looks great yet. When rear was swapped out probably still had a few thousand miles left. I just don't run tires to the cords. These Pirelli's did better than any other tire I've had on this bike. 2004 Yamaha Silverado 1700. So far so good. They feel like they have pretty good grip and they seem to be pretty durable so far. My last no name tires were garbage. But I've heard good about Pirelli, and i got them at a better price through you guys than i did at all the places i checked. Best deal around and service. I put this tire on the front of my Vulcan 500 3 years ago. At 38000 miles I am about to buy another one. Can't beat that kind of life for the price. I have had these tires on a previous bike (Virago) and I loved them. When I purchased my Honda Spirit I knew one of the first things I was going to replace was the tires. The price that Jake Wilson had was good, and they were offering a tire rebate on top of that!!! The Rt. 66 tires were installed locally and I noticed a difference right away. I don't know how long the tires will last on this bike, but I know that got through several seasons on my Virago. If I get anything close with the Spirit - I will be happy. 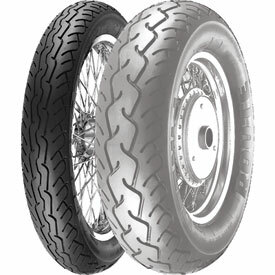 For the price, ride, handling, and wear these are great tires. Bought a set in December 2010. 16,500 miles on the bike, now have 30,256. Tire has been excellent. Will be replacing with another set soon. For price and durability, and road confidence. I recommend this tire. For the price you can't beat this tire. Wears good and plenty of traction wet or dry. Better than the Commander II. Tires came in two days. Mounted them and they are great. I installed a set of these on my Roadstar replacing the Pirelli's that I have been running. I have gotten more miles and the handling has also improved. I purchased the front tire to match the rear MT66 tire that had already hit about 6,000 miles. With the matching front tire mounted the personality of the bike's performance noticeably improved. Cornering, wet-weather handling, and overall smoothness were prevalent while riding. As of this review, my rear tire has over 9,000 miles and is finally showing a smoothed center tread. The front tire, now with about 3,000 miles on it shows almost as good as the day I mounted on the wheel. Of the 5 or 6 tires I've tried (not including the factory tires that were on the bike bike originally) the Pirelli MT66 tires are by far the best buy for this type of cruiser. Some extra informatIon: I have commuted on this bike since I bought it in August 2008 through the Spring of 2014. I have over 51,000 miles logged on it - almost 10,000 of those miles on the current rear tire. I am on my second pair of MT66's both front and rear and love them on this bike. Grip is excellent both dry and wet and will definitely keep using these tires. grooves steering is more responsive great upgrade. Tire shipped fast and packaged well. I replaced my OEM dunny at 6K miles with Pirelli MT66 at first I was a bit skeptical, never used Pirelli before but I was looking for a good tire at a better price than the more common used tires. One that would last better than 6K to 8K miles (if theirs such a thing. I've been very pleased with this tire. I have now just over 29K miles on the odometer and still have a few more miles left on the tire, the impressive part is that the side walls are in great shape (for a little over a year old tire), not cracked like I normally see after a good season of ridding. Sure the tire has some cupping and normall wear but not excessive. I ride 2up a lot and would recommend this tire to any one. I know that Honda has an issue with not having an accurate odometer but the longevity and performance of the MT66 goes with out question.